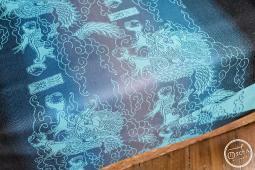 Indigo blue runs to dusty purple and turquoise blue hues then into a wonderful fade of sky tones on this gorgeous preorder wrap. Featuring the popular Shui Long design this wrap is beautifully thick and cushy, with pure bamboo and organic combed cotton adding softness and organic linen lending a delicate strength and a hint of shimmer. 28% organic combed cotton, 12% organic linen, 36% pure bamboo, 24% cotton, approx. 345 gsm. 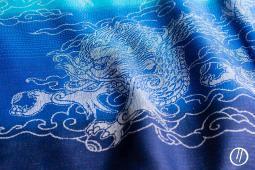 Shuǐ Lóng Aeon is woven on a stunning royal blue warp with ecru dragons emerging in a silvery hue. 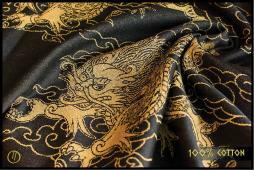 Soft and silky to the touch, with a gentle bounce, it is lightweight and strong. A Boutique construction of 40% Organic Combed cotton, 20% Camel hair, 20% silk and 20% organic linen. It is approx 220gsm. 19 wraps and 5 ring slings have been made. A mix of fiery and deep reds on black. 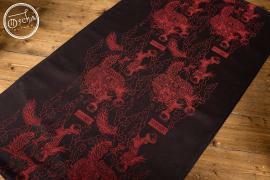 This special mix of hemp and bamboo yarns makes a stunning, regal wrap with beautiful reflective qualities. This wrap will require a little breaking in due to the hemp weft, it will soften quickly and has the silky feeling of bamboo combined with the strength of hemp. 50% organic combed cotton, 25% bamboo, 25% hemp, approx 263gsm. The last additions from the blue/teal warp to the Winter Solstice Collection this year. 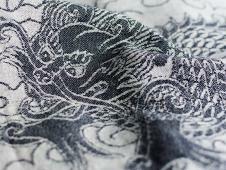 Shuǐ Lóng Arctic is woven with 100% organic combed cotton, Sundara Frost is a blend of wild silk and cotton and Koi Frost is woven with organic linen. 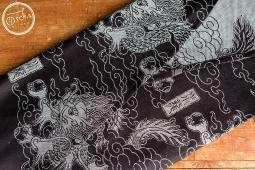 Koi and Sundara will be available at 8pm GMT tonight and Shuǐ Lóng tomorrow at 2pm GMT. 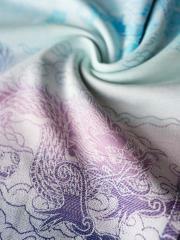 A stunning Boutique blend woven on a fade from teal to deep purple with a chalk wool, silk weft. A proper thick woolly blend, this is most suitable for bigger kids, although it will soften a lot with use. 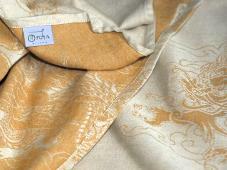 Approx 270gsm, 15% tussah silk, 40% wool, 45% organic combed cotton. 29 wraps are available. 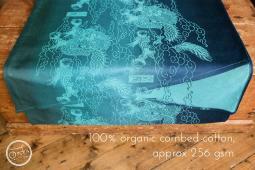 50% organic combed cotton, 50% hemp, approx 239gsm. To be listed on our site this evening. 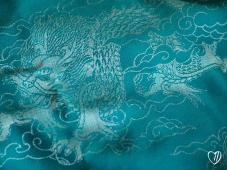 50% combed grey cotton and 50% teal blue hemp, approx 250gsm. Limited numbers available. 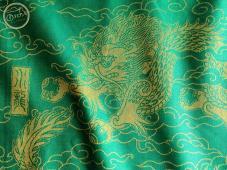 The Shuǐ Lóng pattern on a rich, forest green warp with a golden linen weft. Approx 250gsm. 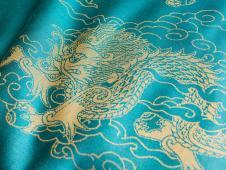 Rich teal combed cotton with a golden hemp weft in the Shui Long pattern. Approx 270gsm. A new blend in 30% mohair, 10% silk, 10% linen and 50% cotton. 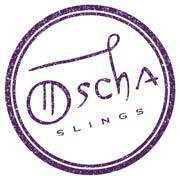 24 wraps and 4 ring slings are available. 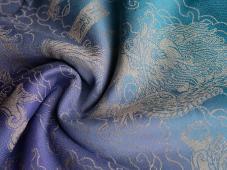 A lovely medium weight wrap with wonderful depth of colour. We've had great feedback from our testers about the wrapping qualities of this blend. 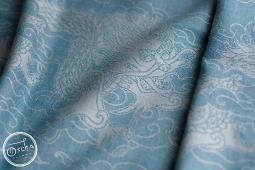 Shuǐ Lóng Mica is a Boutique item in a new blend - 45% cashmere/15% linen/40% cotton. Although it is a good medium weight wrap at 238gsm it feels thin and dense in hand and has a lovely structure for easy, effortless wrapping. 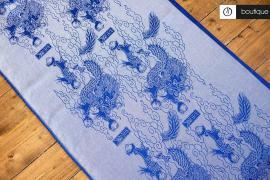 In spite of the linen content it softens very quickly and fluffs up a little. This can be used all year round and is a beautifully luxurious wrap. We have around 40 of these available. Deep comfort with linen/cotton ecru warp and ochre tussah silk weft. A beautifully soft and supportive wrap. 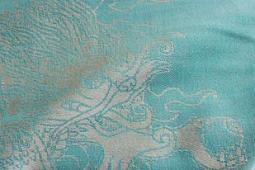 40% tussah silk 20% linen 40% cotton.